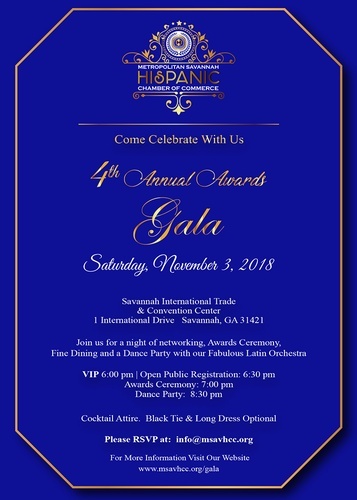 The Metropolitan Savannah Hispanic Chamber of Commerce Board of Directors and its Officers are excited to announce our 4th Annual Awards Banquet and Gala. This is the Chamber's signature event designed to recognize the achievements of the Metropolitan Savannah region's top Hispanic-owned businesses, dynamic industry leaders and major corporations that are committed to improve supplier diversity. These individuals have had a significant impact on the local Hispanic community and they will be publicly recognized with the Hispanic Chamber's Crystal Globe. This Latin-themed gala will also celebrate the interdependence between the Savannah Tourism and Hospitality industries and the growth of the Metro Savannah Hispanic Business Community. The Leadership in these two industries has had a significant impact on the local Hispanic community, its economy, and its growth. The 4th Annual Awards Banquet and Gala will be on Saturday, November 3rd, 2018 at the Savannah International Trade and Convention Center in downtown Savannah. The Celebration will Kick-Off with an Open Bar VIP Cocktail at 6:00 p.m., Awards Banquet at 7:00 p.m., and on to the Dance Floor at 8:30 p.m. This event expects 400+ attendees, including local and network media, and plenty of public attention since it will mark its fourth event celebrating the important contributions of Hispanics living in the Coastal Empire. Tickets for this event are at the Early-bird rate of $90 and $100 after the deadline or at the door. Tables (seats 10 dinner guests) are available for $800 ($1000 after deadline). Sponsorship opportunities are still available for local business owners and corporations who want to show their support and commitment to our local Hispanic entrepreneurial community. VIP Session 6:00 p.m.- 7:00 p.m. Awards Banquet Dinner 7:00 p.m. - 8:30 p.m.
Salsa Night (Dance) 8:30 p.m. - 11:30 p.m.